In Strange Cases – The Lighthouse Mystery, FBI Agent Tom died in a bizarre circumstances and it is now up to long time partner, Agent Claire to solve the case. The story line is presented in story telling mode. There are 6 chapters to finish in this mystery. When I play this game, I thought…oh, here is another hidden object game. Little did I know that to get to the hidden object games, you have to follow the cards to get to the correct rooms to discover the missing items. This includes a bit of the escape room feature here. When you click too many times on the wrong object, a cursor penalty will initiate. It will go round and round for a while and will not let you move the cursor. This is quite successful in preventing me to click vigorously and blindly on the objects as the cursor penalty is a little annoying here. If you are stuck, use the Hint button. The “hint” button will recharge each time you use it. As for the Inventory, the key items of the investigation are kept there. If you want to use a key item, select it from your inventory and use it in the scene. There are also some special cursors when you need to solve a puzzle or use inventory that you have to unlock the missing item. Good thing is that the hidden objects here are not too tiny, so I do not have to stress my eyes out while trying to play this game. There are different cards that Tom himself left the clue for you. Each card has a different type of hidden object list. The blue card has a standard text list of items to find. The red card has three fragmented items to find; click on the icons at the bottom to switch between items. The green card shows the silhouettes of items you need to find. The crossed-out eye indicates that the card is not yet visible. Overall for the six chapters, you have start investigating by going to Tom’s apartment building. From there proceed to Sarah’s house. And then get to know Tom’s last trip and the underground lab. The last couple of chapters are involving the hidden object scenes for Ryde Corporation and The Talismans. The lines that each character speaks are put in quite a simple and monotonous layout. I wish the developer could make the characters livelier and have more movement. This makes the story telling part a bit dull. Nevertheless, the graphics and colors are quite appropriately real and serious looking here for a mystery solving case. 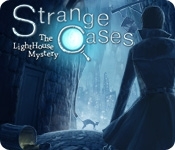 Overall, I did get quite excited when I started playing Strange Cases – The Lighthouse Mystery. However, when I was stuck at the hidden object games for the clues, I feel that the game became too dragging and I lost my momentum while playing this game. However, I will leave it up for you to decide. I would rate this game a 2.5 out of 5 ratings. Review courtesy of Mabel Lee. To view more PC and online game reviews for casual games, visit MabelGames. Playing PC and online games have many advantages and keeps an active and healthy mind. Visit the collection of the downloadable PC and online games’ review site. The games are free to download and have fun!